"A fun site for serious daters," Spark.com is an online dating service that seems to be in touch with its audience's needs. All people are welcome. The majority of Spark's community is Caucasian Americans. 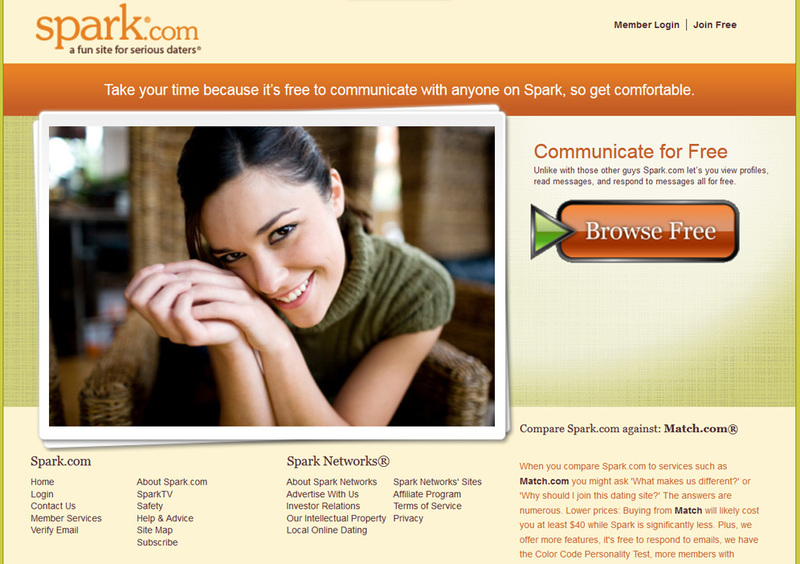 Unlike some competing dating websites, Spark makes it easy to communicate with others. Daters don't feel pressured by limited trials and features. These users can check out profiles, read messages and respond to them for free. Spark requires all visitors to post photos. A plus is that they are able to control who can view them. With a free account, you can post as many as 12 photos. This way daters get to know who they are conversing with right away. On other online dating websites, some profiles are void of photos, get less profile views, and make the site look like it is poorly managed. Once users have browsed photos freely, then they can create a profile. The site is user-friendly making it easy to navigate pages and loads fast. Spark users are encouraged to share interests, relationship thoughts, and provide other useful information on the site to help them make connections. The dating site has a search function and members are able to enter preferences and locations of potential dates. This dating website offers many features and is considered more affordable than most. Subscribers have access to all features. Free members have some limitations, but are still able to communicate with potential prospects. One quality that makes Spark stand out from the rest is its Color Code personality test. Participants are asked many questions based on how they view themselves as children. The company claims this helps with the match-making process and online daters can learn more about themselves. Once results are provided, there are dating tips on how to effectively communicate with a dater's color type. Spark singles are able to email one another once their profiles have been set up. Subscribers can communicate with anyone they like. If there is no interest, there is a function to decline contact. The website has Instant Messaging (IM) a well as video and audio chat and text capabilities. Chatting can be done in real time and members can also chat live in the chat rooms. Subscribers can send E-cards to "spark" interest between one another. When subscribers are ready to make some fun connections, Spark has a Secret Admirer alert. Subscribers can respond by communicating interest in one another anonymously until they are ready to reveal themselves. When subscribers meet someone they like, they can place them in their favorites and track others using the Hot List feature. There are message boards on the Spark website and this is where members share information about their dating experiences, local entertainment, and ask related questions. 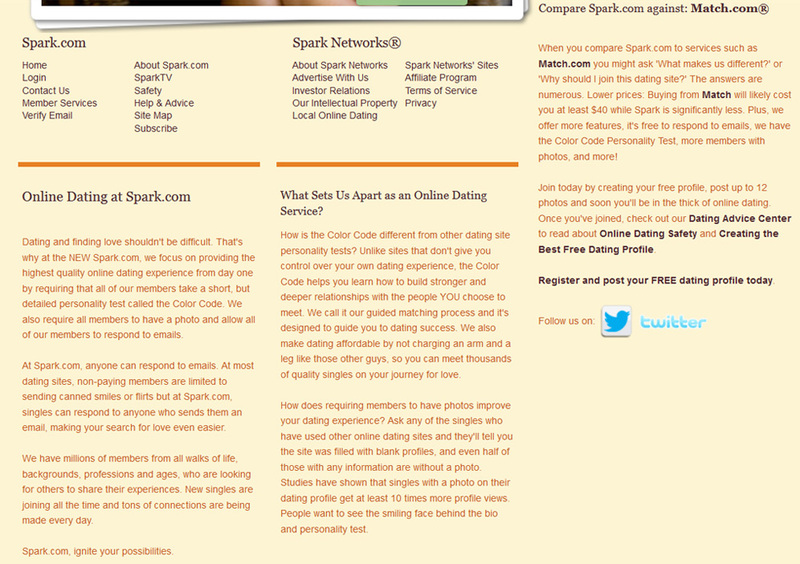 Some online daters who have used Spark rated the website favorably around the web and found the design good to view. They also found the services inexpensive. The subscription membership prices per plan are cheaper than their major competitors. Do stop by the site to see the current prices. Now there were those past users who were not impressed with the site. After sending over a hundred emails, a single male and date site reviewer shared that he got less than 10 email replies and no dates. He commented he sent the emails one per day for two months. He also found his email was filled with Spark notifications that he couldn't turn off. Those emails linked to fake profiles. As for real profiles, the former subscriber was unimpressed with how the women looked. Overall, the site does have good features and offers good features even if you don't pay. However, if you want high-quality dates, then be willing to spend more time and money on other dating websites.